But as it goes, sometimes we find ourselves hanging on pretty darn tight. Thinking only about the bumpy part of the ride. Thinking about what huge drop might come next. Thinking the ride isn’t perfect. Jerry would be so disappointed. This morning I remembered something a very wise friend once shared with me. Riding in her car, I noticed a yellow dot on her rear view mirror. When asked why, she explained that she liked to stick yellow dots in all sorts of places as a reminder that it doesn’t have to be a perfect day to be a great day. It doesn’t have to be a perfect day to be a great day. 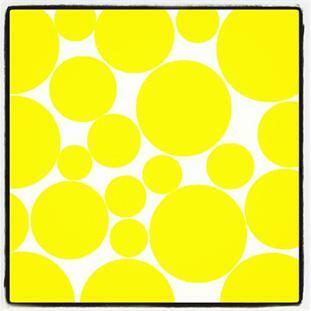 It’s time to get some sweet yellow dots. And stick them everywhere. And remember to enjoy the ride we are on. And maybe even let go of the bar, put our hands up, and scream. Get ready for great sweet friends!